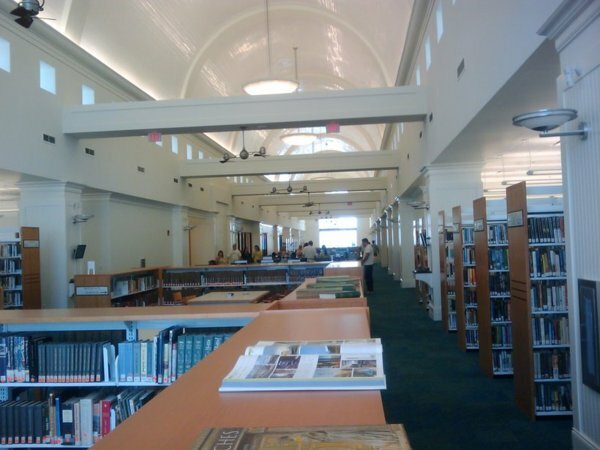 It has been well worth the wait for the new City of West Palm Beach library, part of City Center on the 400 block of Clematis Street. This is not at all like any other libraries I have seen. It is artfully designed on four separate floors to accomodate four different preferences. The spectacular block-long sun-lit fourth floor is the traditional library, with books, tables, computers, and quiet (see two pictures below). The third floor space is for the small children. The second floor space is for high-tech, music, noise, and teenagers. The first floor space is like a modern bookstore, with the latest books and a cafe. The fourth floor has a massive number of computers for public use and Internet access. 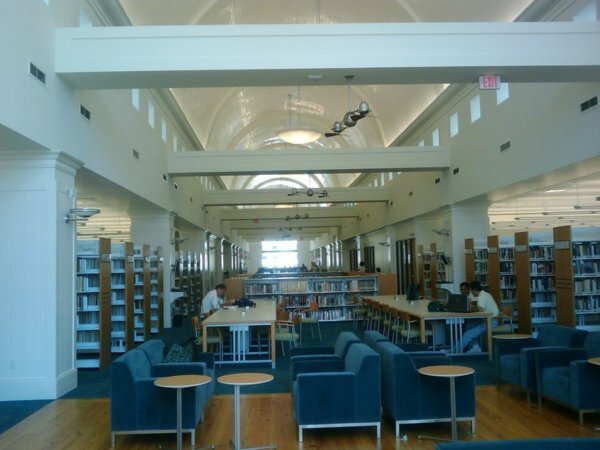 In addition, it has some other neat features like separate study rooms and a Florida room containing mostly books about Florida and Palm Beach County history. I haven't really used a public library recently, and didn't even remember how to look up a book in a card catalog. No need to remember that any more - the new library is so easy to use! Surrounding the computers on the 4th floor (and on the other floors are well) there are numerous separate open stations with high computer screens where you can simply type in what you are looking for, just as simple as a Google search, and it will come up with the relevant books and where they are located in the library. You can search by book title, book author, or by general search topic. The system is extremely easy to use and the locations of books and other items are very logically arranged. This is certainly the best library I have ever seen. And that very comment is heard throughout the new library as other people see it for the first time -- I was there for fifteen minutes today, and I heard that comment from at least two different groups of people. There are a few things that need to be worked on. First, although there are stairs between the 2nd and 1st floor, the public is currently required to take the elevators for access to the 4th and 3rd floors. Of course staircases exist but they are all marked "emergency exit only, alarm will ring". Many people are complaining about this, and many people prefer not to wait for the elevators, or be stuck in a large crowd in the elevator when it finally comes. The library must find a way to open at least one staircase all the way down from the 4th floor, at least to the 2nd floor. The second thing that needs work is a bit harder to define. There is an unusual somewhat unpleasant smell in portions of the library. It appears to be strongest around the elevators and may be coming from the new wooden floors that surround the elevators. Normally one would expect a very pleasant new building smell when one enters a new building, but in this case the smell is not really that nice. Fortunately, it is confined to only small parts of the library. Overall, though, this new library is absolutely terrific. It is truly a gem for the City of West Palm Beach. And it's located right in the middle of Clematis Street, so its opening marks a truly banner year for this historical street. Just a few days after the new library opened, one of the most famous political figures of the 1960s and 70s in the United States came to the 4th floor for a brief speech and book signing. Yes, George McGovern was there, speaking to a crowd of about 100 people, and it was possible to get right up in front to see him up close. Whether you're a Republican or Democrat, this was clearly a coup for the library to have such a famous figure here within days of its opening. He said several interesting things in his opening remarks. First, he mentioned a rule that he had formulated about half way through his life -- never hold a grudge against anyone for more than 30 days. He also made clear his distaste for the money that has been spent on the war in Iraq and somewhat surprisingly, the war in Afghanistan as well. He talked about a venture he is engaged in jointly with another former presidential candidate, Bob Dole, to feed lunches to poor children around the world. He also mentioned that, when someone approached him in an airport and said, "George, how old are you? And, when are you going to retire?! ", he answered, 86, and that he has no intention of retiring, while there are still things he wants to do. Finally, he mentioned that the Palm Beach area (presumably including West Palm Beach) was far-and-away the best area within the continental U.S. to live. He mentioned that he had no regrets, in retrospect, about losing the 1972 presidential election bid against Richard Nixon. He mentioned how many members of the Senate and House had told him that they had decided to get into politics because they were inspired by his presidential run. And he mentioned having attended the funeral of Richard Nixon, and that he didn't hold any grudges against President Nixon or anyone else. 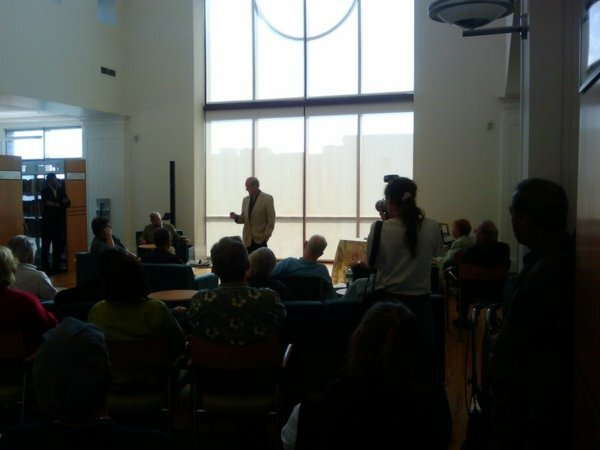 Below is a picture of him making a point to the crowd gathered at the West Palm Beach library.